A new music video, "The Moon and More," highlights the many missions of NASA that open new doors for learning about space. Musicians Javier Colon and Matt Cusson have released an earnest new music video highlighting NASA's Lunar Reconnaissance Orbiter (LRO) and the inspiration derived from studying the moon. The video, "The Moon and More," was created in collaboration with NASA's Goddard Space Flight Center. It follows a young boy on his journey to becoming a NASA engineer and working on the LRO mission. A key verse of the song says, "We will see things we've never seen before, open up a door to a new world and go explore the moon and so much more." The lyrics speak to the opportunities provided by the LRO mission and emphasize that there is still a lot humanity has yet to learn about space. "This project brought me back to when I was a kid watching NASA launch the shuttle missions," Colon, Season 1 winner of NBC's "The Voice," said in the statement. "Every kid at some point wants to fly, and I think that dream has a lot to do with NASA's exploration of space and discoveries." The LRO launched on June 18, 2009, to study the moon and help NASA plan for future lunar-exploration missions. For the last seven years, the probe has collected valuable information on Earth's nearest neighbor and scouted safe, potential landing sites. NASA has said it expects the spacecraft to continue to study the moon for two to four more years. "It was exciting to have this chance to work with NASA," Cusson added. "As a musician, you don't usually think that this is something you could do. But I was honored to offer up my skills and music, and to bring the worlds of science and music together." The music video was filmed at various locations, including the Intrepid Sea, Air and Space Museum in New York; the National Air and Space Museum in Washington, D.C.; the Connecticut Science Center in Hartford; the Hartt School of the University of Hartford in Connecticut; and the "Living on Mars" mural in the Bronx, New York, according to the statement. A leading theme of the music video is to "inspire future generations." Over the course of the video, viewers see the young boy grow and achieve his dreams of working for NASA, inspiring his daughter to do the same. The end of the video showcases not only the LRO mission, but also NASA's journey to Mars, the Jupiter probe Juno and more. 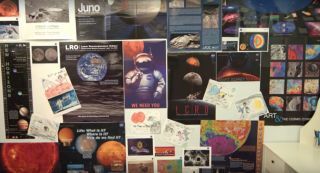 "A number of us working on LRO have had something inspire us to pursue careers in science and engineering," Noah Petro, LRO deputy project scientist at Goddard, said in the statement. "This video serves as an opportunity to inspire future generations to follow their dreams into the sciences or the arts."